Stakeholders in the health sector have identified gaps in emergency preparedness and called for concerted efforts to bridge them to ensure global best practices. Speaking at the training of health workers from general hospitals in Lagos State on management of emerging infectious diseases, Dr. Jide Idris, the state Commissioner for Health said inadequate personnel and data on vulnerability/health risk, non-availability of risk specific contingency plans were some of the factors accounting for the poor state of affairs. Others he said were inadequate information on available resources and inadequacy of Biosafety and Bio-containment laboratories. The training was organised by the Dr. Ameyo Stella Adadevoh (DRASA) Trust Fundat the Lagos State Chamber Of Commerce and Industry (LCCI) Conference Centre. He noted that the State Government is intensifying efforts towards resolving these challenges and developing emergency preparedness and response in the state to a desirable level. The Lagos Health Ministry boss stressed that the training is critical for the State. “This training is very crucial in that, with a population of over 22 million people and rapid urbanisation, Lagos State remains at high risk of outbreak of infectious diseases,” Idris said. According to him, the aim of the training is to increase the capacity of the health workers to identify and promptly manage patients during outbreak of emerging infectious diseases. These diseases are mostly deadly viral infections, he explained. The focus of the training was on a group of illnesses called viral haemorrhagic fevers (VHFs) which includes deadly viruses such as Ebola, Lassa fever, Yellow fever, and Dengue. These viruses, the Commissioner observed cause sporadic outbreaks all over the country and the goal of the training is to build capacity in identifying and containing them in the megacity of Lagos. In line with the preparedness strategy, Idris said that all Medical Directors of General Hospital in the State have been directed to designate a ward as isolation unit to quarantine suspected cases. Institutionalisation of emergency preparedness has enabled Lagos State to respond rapidly, efficiently and effectively to emergencies and humanitarian crisis, the Commissioner said. Some of the emergencies that the State had responded to in the last decade include Massive flooding of the Ajengunle community in Ikorordu, 2012;Measles and Cholera outbreak, 2013; Ebola Virus Disease outbreak, 2014; Lassa Fever Outbreak, 2015- 2016 and Cholera outbreak in 2016. To curtail future disease outbreak, Idris also said that the State has conducted resource mapping for emergency preparedness and response across its ministries, directorates and agencies. “We are in the process of developing a policy document and guidelines on health sector response to emergencies as well as humanitarian crisis and developing Logistics Preparedness and Management Plan. The State has also embarked on “continuous capacity building of various cadres of health personnel on disease surveillance and emergency management, especially cascading the recent national training on Public Health Emergency Operation Centre (PHEOC) conducted by NCDC in collaboration with US CDC,” the Commissioner said. He pledged the commitment of the State Government to the successful implementation of the larger project of DRASA in the State, which is the establishment of a Simulation Training on Emergency Preparedness and Response for Emerging Infectious Disease Centre in Lagos Mainland Hospital, Yaba. Similarly, the Managing Director of DRASA, Niniola Soleye, said that her company organized the training with the support of Lagos State Ministry of Health (LSMoH). Soleye also said the aim of the training was to boost the capacity of the health workers to identify and promptly manage patients during outbreak of emerging infectious diseases. Corroborating earlier views, the Managing Director of DRASA stressed that the training is centred on deadly viral infectious illnesses called viral haemorrhagic fevers (VHFs) which includes deadly viruses such as Ebola, Lassa fever, Yellow fever, and Dengue. She said; “With this training, LSMoH and DRASA seek to increase the state’s level of outbreak preparedness, protect its health workers and help keep the people in Lagos state safer. 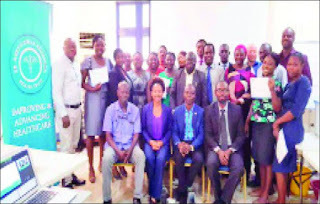 According to her, the training is to be held in batches even as she noted that her company planned to host 50 health workers in the just concluded first batch which had 34 in attendance. She added that beneficiaries of the training are expected to cascade their lessons to others in their respective facilities.